If you love peace and quiet in a rainforest setting, then the Goomburra section of Main Range National Park should be on your shortlist. Manna Gum campground. Plenty of space here! Lush vegetation surrounded our campground at Manna Gum camping area, home to thousands of birds. Arriving late on a hot afternoon, the clouds and mist rolled in from the east to bring a welcome cooler change. By early next morning that distinctive smell of damp rainforest filled our nostrils, signalling a respite from the heat. It was time to break out the hiking boots and explore the area on foot. 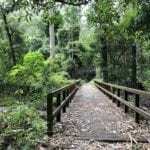 Three fantastic walking tracks start at Manna Gum campground. 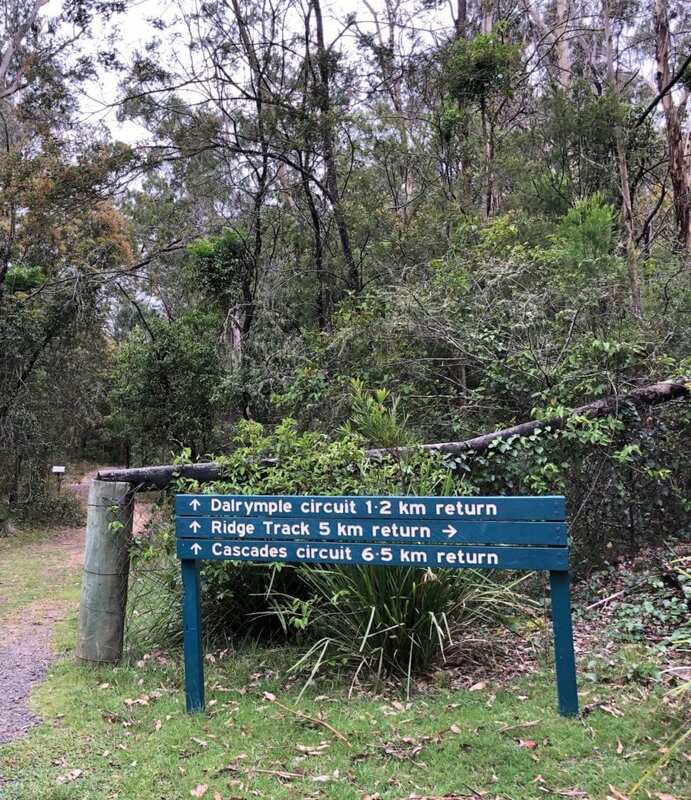 But first, where is Main Range National Park? 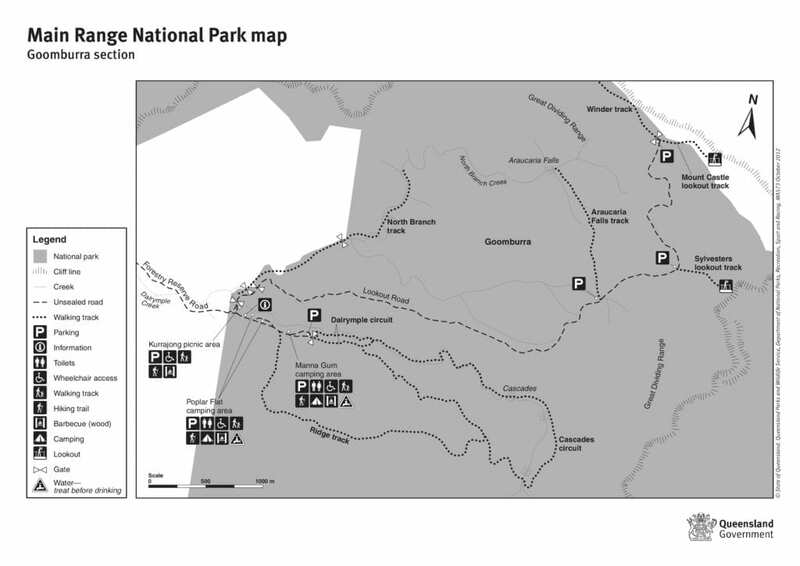 Main Range National Park is big, stretching about 60 km north from the NSW/QLD border, all the way up to Mt Mistake. In all, it incorporates nearly 30,000 hectares and is part of South-East Queensland’s Scenic Rim. The Goomburra (an Aboriginal word meaning either “fire black tribe” or “shield”) section of this national park is between Ipswich and Warwick in Queensland, north of the Cunningham Highway. Coming from the coast, you’ll climb up into the ranges up through Cunninghams Gap. 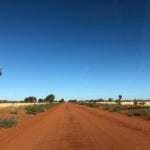 Manna Gum campground is a stone’s throw to your north. However you’ll need to continue west along the Cunningham Highway for about 40km then take a right turn. It’s well signposted. From here you follow the road for about 35km. This road basically follows an adjacent valley just north of the Cunningham Highway. So you kind of need to retrace your steps. The destination is worth the backtracking though. Even the drive in is spectacular in places. Once out of the cleared cropping country, you’re into a forested valley. Even the cropping country’s deep black basalt soil is worth seeing, looking for all the world like a giant chocolate mud cake. 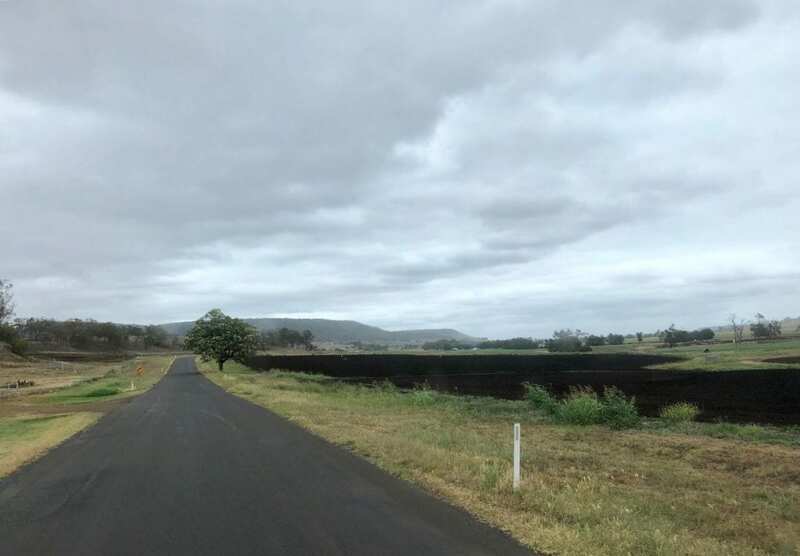 Rich black basalt soil on the road into Goomburra. As you travel east up the valley the bush closes in around you, dotted with several privately run campgrounds. Dalrymple Creek threads its way down the valley, tricking over black basalt rock. It’s a beautiful drive into the National Park. The water you see in this creek eventually ends up in the Southern Ocean in South Australia. You see, Dalrymple Creek is a tributary of the Condamine River, which is a tributary of the Darling River, which flows into the Murray River, which flows into the Southern Ocean! Dalrymple Creek near Manna Gum campground. No wonder early explorers were convinced an inland sea existed. Who could ever imagine a creek in South-East Queensland would cross half the continent before reaching the ocean. In Australian geological time spans, this country is quite young. About 25 million years ago a volcano spat out masses of lava, spreading eastwards to Ipswich and west past Warwick. The east side of the lava flow was quite steep so it eroded away, assisted by various creeks and rivers. An escarpment formed to the east and is gradually eating away the lava sheet. This escarpment consists of the imposing cliff faces you now see when driving west along the Cunningham Highway. You can get a feel for the scale of this lava flow by taking the easy Sylvesters Lookout walk. This walk takes you right to the edge of the escarpment. With the incredibly fertile basalt soils, warm climate and a high rainfall, this region is ideal for rainforests. In fact, this is one of the few places we’re remnants of the Gondwana rainforests still thrive. Way back in time, Gondwana rainforests covered the entire continent. What a different place Australia would have been then. Back then it was a part of what’s now Antartica, South America and New Zealand. 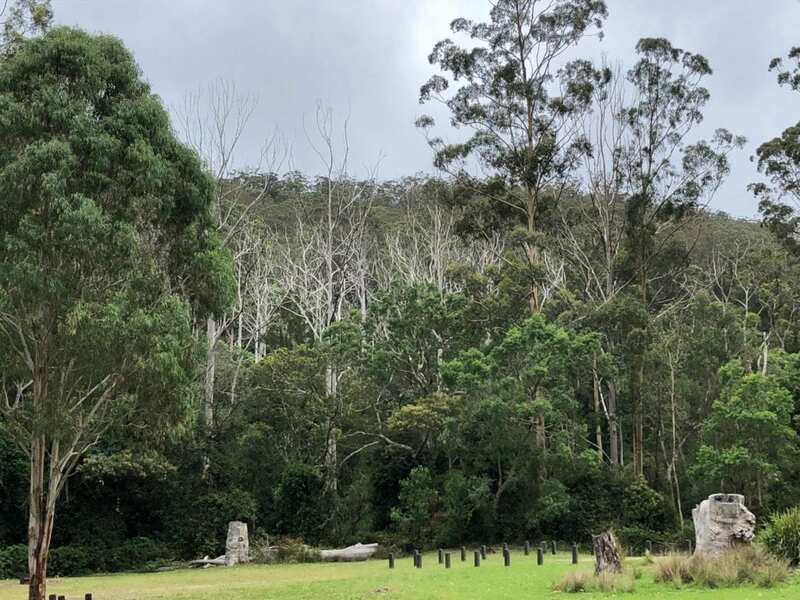 World Heritage listed in 1994, Main Range National Park forms the northernmost link in a chain of Gondwana national parks all the way down to Barrington Tops. Once you start exploring, you’ll understand why this region is unique. On the Ridge Track Walk for example, you’ll see a cluster of hoop pines. They’re an ancient throwback to the Gondwana rainforests. They cover one particular part of one ridge, forming a dense forest where the understory is in perpetual gloom. And some creatures in this region are direct throwbacks to ancient species. Ever heard of the red and yellow mountain frog for example? We’re fortunate this rainforest survived really. 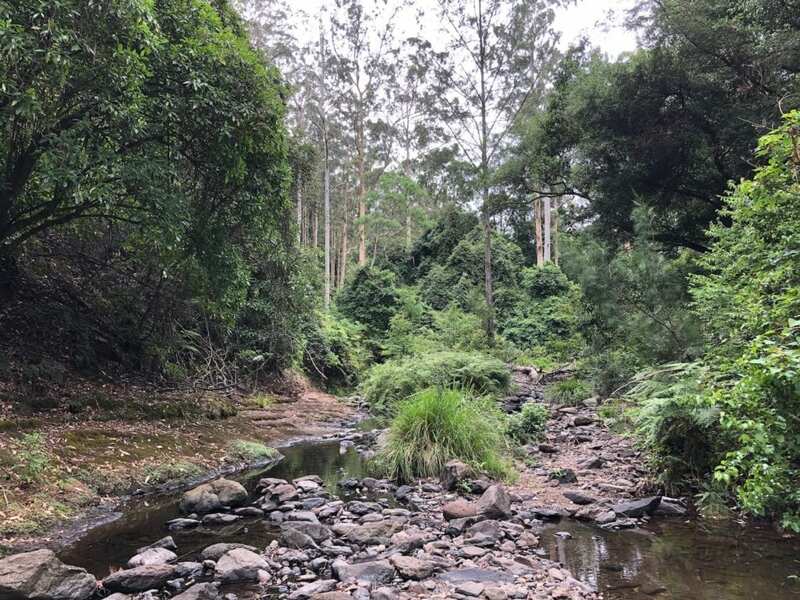 Some determined attempts were made to clear it for cattle grazing, log it for red cedar, blackbutt, manna gum, rose mahongany and so on, and then Forestry tried to grow poplars, maple, pine and so on with the view to using the land for plantation trees. You’ll see lots of old tree stumps where giant trees were felled. Most of the giants are gone now, cut down long ago. And the stands of red cedar are a distant memory. Fortunately some places were simply too steep to log, so tiny patches survived. 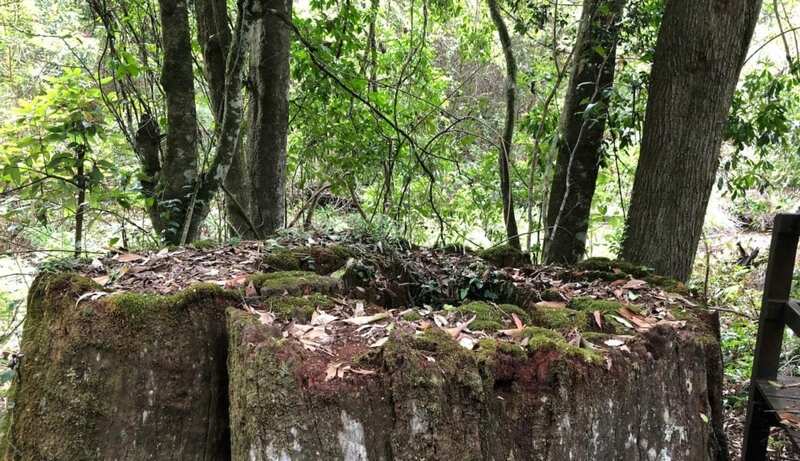 A giant tree stump is testament to a time when this area was logged. You can see this on the easy Dalrymple Walk, close to Manna Gum campground. On some walks it’s obvious where lots of trees were cut down. The surrounding bush has large trees and reasonably clean undergrowth. However the logged areas have some small trees, but mainly a mass of impenetrable vines and invasive weeds like lantana. Once the sunlight flooded in, the undergrowth grew like crazy and strangled any young suckers that would normally grow there. 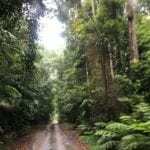 The various walks really are the best way to experience the beautiful rainforest. Or if you’re feeling lazy, set up a chair and simply gaze into the rainforest from your camp site. You’ll likely have cute blue wrens keeping you company. Hardly bigger than a golf balls with toothpicks for legs, they hop and dart and flit… all the time looking incredibly handsome with their tiny chests proudly puffed out! What Facilities Are At The Campgrounds? 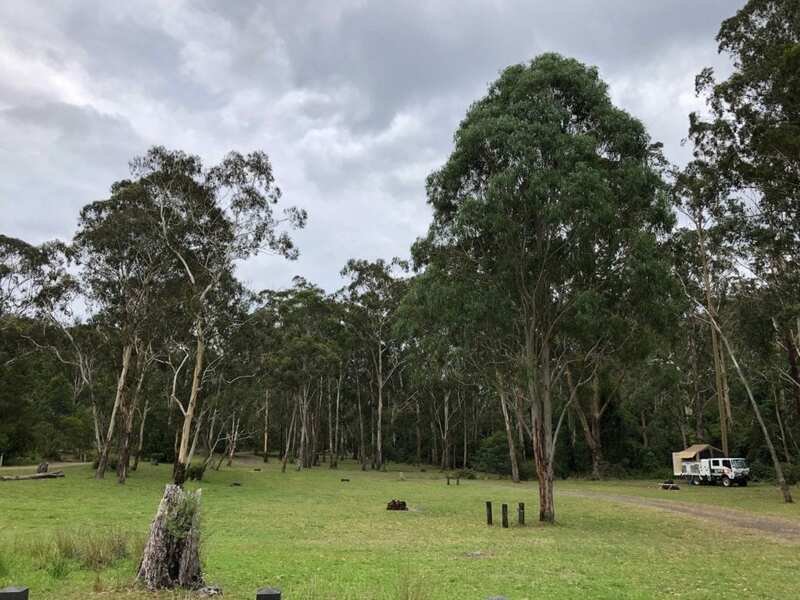 Speaking of camp sites at Goomburra. You have the choice of two, Poplar Flat and Manna Gum. They are only a couple of hundred metres from each other, along the same track. Poplar Flat is the first one and seems to be more popular with caravaners. Both are excellent with plenty of shady spots and lots of green grass. If you prefer not to camp under trees, there’s plenty of room to be out in the open. You’ll find drop toilets with a tap to wash your hands, a couple of taps where you can get water for washing up (not for drinking) and fire pits. Apart from these few “luxuries”, you’ll have to be fully self-contained. The only downside? During our visit in January the creek was just a trickle. Going by the drought conditions further down the valley, we assume the creek was unusually dry. So swimming wasn’t an option. So if you’re looking for a quiet bush camp where you can swim, you might have to look elsewhere. On the upside, both campgrounds are ideal places to set up while you explore. Three walking tracks start at the eastern end of Manna Gums. Plus you can drive along Lookout Road to Sylvesters Lookout and Mount Castle Lookout, and access another three walking tracks along Lookout Road. If you like bushwalking, Goomburra has plenty to offer. 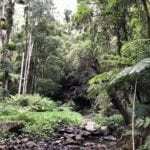 The Goomburra section of Main Range National Park is an excellent introduction to the Gondwana national parks. Camping in amongst the rainforest is a special experience. A stand of dead gums behind Manna Gum campground. I’m guessing they are a result of a bushfire some time ago. Not sure. 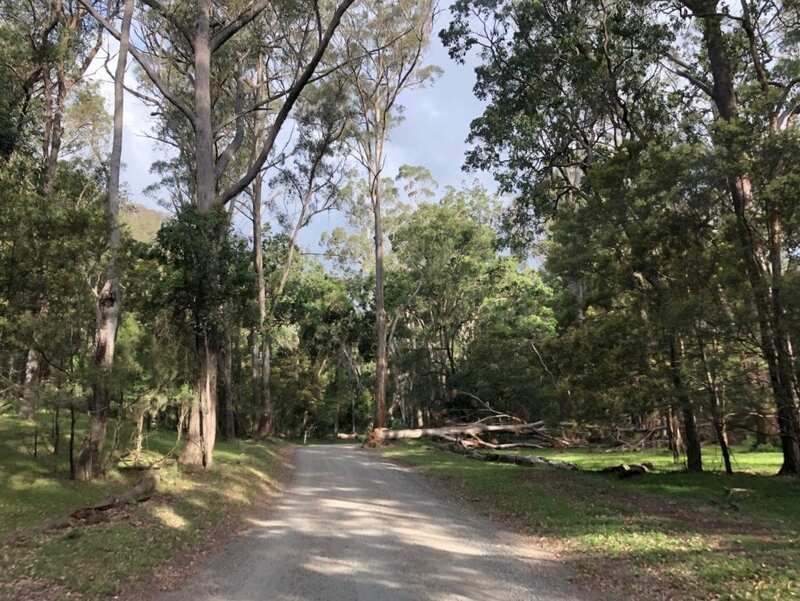 Apart from the occasional vehicle cruising past to the day parking area on their way to explore the walking tracks, the only sound you’ll hear is the constant singing of thousands of birds during the day and the contented croaks of frogs at night. A special place, and easy to get to in a conventional car. If you’re looking for ideas on tours or places to stay around South-East Queensland, TourRadar have a good selection. 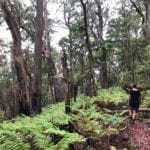 Main Range National Park is on Barunggam and Bundjalung Country. For more QLD National Parks you can visit, go here.